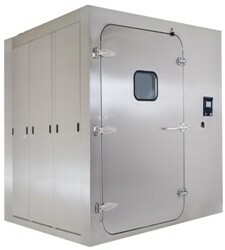 Physical Containment (PC3/PC4) labs are facilities in which work is done with agents which may cause serious or potentially lethal disease after inhalation. This includes bacteria, viruses, and parasites which can be fatal to humans but treatment exists. 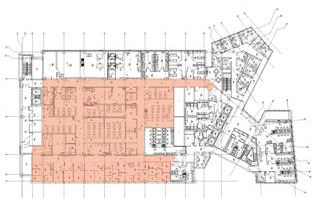 Safe use of a PC3/PC4 facility depends on a well designed facility, careful adherence to safety procedures, and an effective decontamination plan. 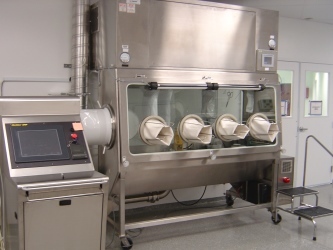 Only gaseous decontaminating agents such as formaldehyde and chlorine dioxide gas offer an effective means of decontamination against organisms in a non-ideal setting. 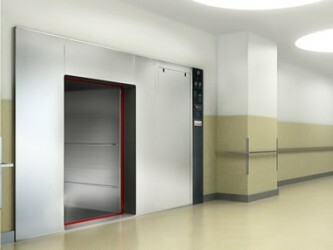 They are used because they are the only decontaminating agents that are truly effective in areas that are difficult to reach such as in floor drains, ceiling grids, the underside of furniture and components, the inside of cabinets, hinges, instruments and components, and other difficult to reach areas. Other decontaminating methods such as sprays, mists, foggers, vapor generation systems, and manual wiping are not effective because they do not reach all areas at an effective concentration. 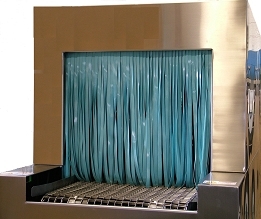 Vapor generation systems temporarily create vapors that transform back into a liquid upon delivery to the target chamber. 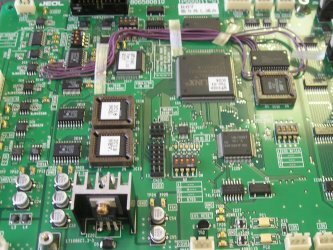 They are subject to temperature gradients that create an uneven distribution of the decontaminating vapor/liquid that scavenge it from warmer areas and condense out on cooler surfaces. This creates areas with a greater amount of the decontaminating agent and areas with less or little. Coverage into difficult areas is also challenged. Chlorine dioxide is a recognized gaseous decontamination agent under Australian and New Zealand Standards AS/NZS 2243.3-2010 Safety in Laboratories – Microbiological Safety and Containment, OGTR and DAFF Biosecurity for Quarantine Control Facilities. 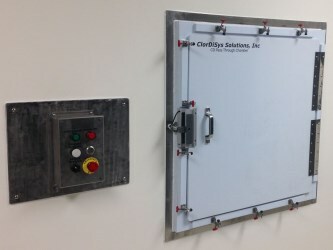 There is no doubt that the protection of your animals, lab personnel, clients and research is of great importance and ClorDiSys Solutions offers many Chlorine Dioxide (CD) based decontamination products and services to protect these valuable assets. 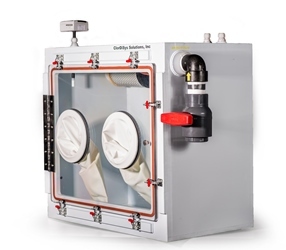 Our gaseous CD is the safest and most effective way to decontaminate your PC-3 and PC-4 laboratories, pass-throughs, chambers, biological safety cabinets, HEPA filters and any other lab spaces. 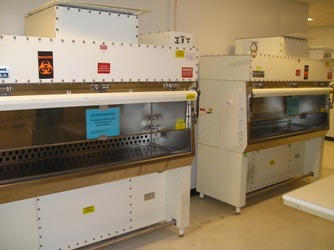 Chlorine dioxide gas is gentle on materials so animal racks, cages, computers and other sensitive equipment can be left in these areas during the decontamination process. 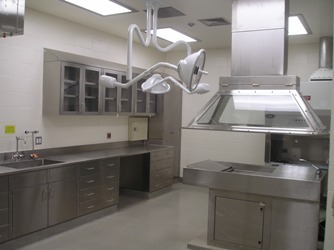 In new or renovated facilities all your brand new equipment can be brought in, gassed and sterilized in place thus eliminating the need for time consuming and costly autoclaving during move-in. 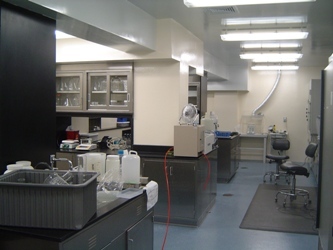 In your existing laboratories, rooms and equipment can be decontaminated all together in one single step. 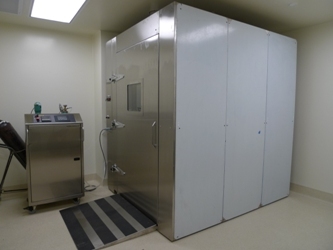 Our chlorine dioxide gas is registered with US Environmental Protection Agency as a sterilant and is able to inactivate all forms of antimicrobial life, including spores. Our process has also proven effective against pinworms and their eggs, a persistent nematode parasite, which can cause costly research delays and stoppages or involve extensive treatment regiments. Download ClorDiSys' paper from the Journal of the American Association for Laboratory Animal Science, Vol. 53, No.4, Exposure to Chlorine Dioxide Gas for 4 Hours Renders Syphacia Ova Nonviable for complete information. 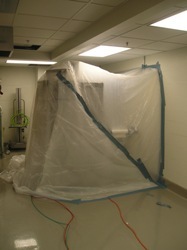 Biosafety offers both equipment and services for decontamination as part of emergency response plans, preventative maintenance programs or contamination control schedules, when outbreaks occur, or for new construction, renovation or decommissioning projects. 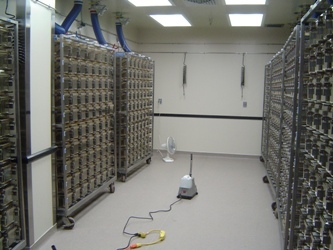 Chlorine dioxide gas fills the space its contained in completely and evenly, making full facility decontamination easy as no surface is left untouched. 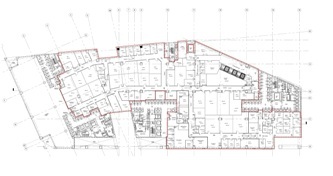 We have decontaminated facility's over 1,000,000 ft3, providing sporicidal kill throughout. 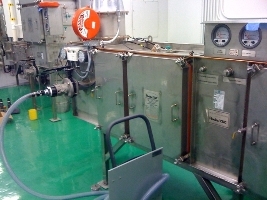 Suitable for new facilities prior to production starting, existing facilities during scheduled shutdown, after renovation, or if contamination is present. 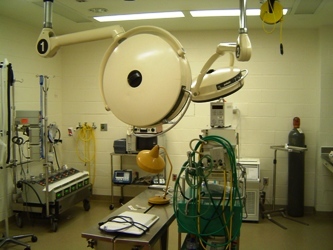 Surgical suites can be decontaminated between surgeries, or at the end of the day depending on the schedule and needs of the facility. 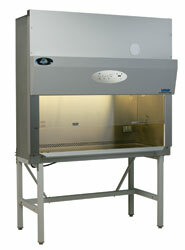 Biological Safety Cabinets are able to be decontaminated with chlorine dioxide gas quickly and effectively. Chlorine dioxide gas and formaldehyde are currently the only decontaminating agents approved by NSF for BSC decontamination. 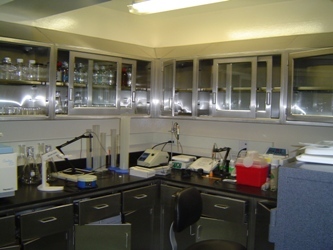 Chlorine dioxide gas is able to reach all surfaces within the cabinet, including the area under the workstation, and the actual HEPA Filter itself. 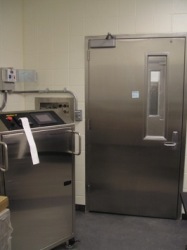 Existing Autoclaves can be converted to replace steam or add the functionality of chlorine dioxide gas. Using chlorine dioxide gas instead of steam allows customers considerable utilities and consumable savings. 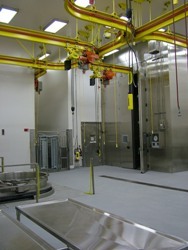 Much like Decon Chambers, passthrough rooms offer the ability to decontaminate equipment and components being brought into or out of barrier facilities. 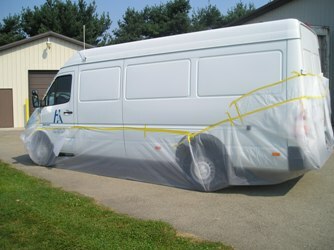 Transport vans can be decontaminated using chlorine dioxide gas between deliveries or on other routine schedules. 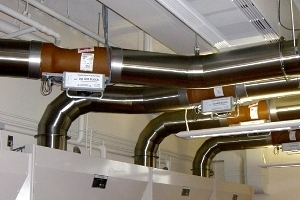 Equipment and components entering a facility can be sprayed down with a liquid chlorine dioxide through the use of a spray tunnel.